It may not be as famous as London, New York or Tokyo, but the Pearl River Delta in Southern China really is the economic capital of the world when it comes to technology, and Guangzhou is at the centre of it. The device you’re reading this on would’ve been built there. So too the components used to make the device. And so too the materials used to make those individual components themselves. Although anonymous by Western standards, this part of the world is driving the tech industry by sheer manpower. From rapid industrialisation and development, a patchwork of so-called urban villages have emerged as a testament to the delta’s parochial past. These are pockets of dense but comparatively low-rise residential and commercial buildings with narrow laneways and less modern facilities. They are the remnants of village life in what is now the world’s largest megalopolis. Between the shiny skyscrapers are gritty, neon-lit alleyways full of shops and apartments. Hidden in laneways just out of sight of modern supermarkets, the urban villages are home to enormous wet markets. Here you’ll find everything from live rabbits to live turtles, crickets to scorpions. Here, among the ultra-futuristic developments of Guangzhou, persists a decidedly rural approach to fresh produce. The contrast between urban village and supertall skyscraper is stark, yet both are abuzz with local hardware and apps. This exemplifies the cyberpunk aesthetic of high-tech, low life. But whereas slums have emerged in other cities from economic upheaval moving jobs and industry away from rural areas into urban areas, the urban villages of Guangzhou have emerged from economic upheaval in their own backyard. Rice paddies have given way to skyscrapers in a single generation. One of the many hidden wet markets in Guangzhou. This could be a scene from many developing countries but the reality is that it’s in one of the most modern cities in the world. Turtles, eels, scorpions–all live and ready to be cooked! In 1980, Deng Xiaoping initiated capitalist reforms to China’s economy, which became known as “Socialism with Sweatshop Chinese Characteristics”. The Cantonese province of Guangdong was chosen to be the epicentre of these reforms, which entailed cities adopting market-based economies to attract foreign investment. Shenzhen was among the first cities to undergo the transformation, with Guangzhou proper following suit in 1984. Business boomed, and within a few years people were migrating from all over the countryside to work in Guangzhou’s factories. This growth quickly spread to neighbouring cities such as Dongguan and Foshan. Accordingly they’ve expanded so much that it’s impossible to tell where one city starts and another ends—hence why the area has become the Pearl River Megalopolis. Farmland on the outskits of Guangzhou. This once covered the area. Highrise development encroaches on the Pearl River Delta’s dwindling farmlands. Not the difference in living standards. The most transformative industry to arrive in the Delta was the tech industry. Thanks to low costs and seemingly unlimited capacity, the area has essentially become the world’s electronics factory. Companies such as Foxconn operate entire closed cities to operate what are essentially tech-sweatshops. Workers are grossly underpaid, work unbearable hours, and are forced to live in cramped dorms onsite. Some industrial parks even have their own broadcast media and emergency services run by Foxconn and similar companies. Tragically, these conditions have pushed countless workers to take their own lives—an issue Foxconn alleviated by installing suicide nets outside of all windows instead of, y’know, treating workers as human beings. Keep this dystopian nightmare in mind next time you want to buy a new phone. However, Foxconn is just one side of the story. As the entire supply chain exists in the Delta, in all its decentralised glory, an organic ecosystem has emerged whereby small-scale hardware and component manufacturers are rethinking how we use technology. Shanzhai refers to what we know as Chinese knock-off products such as imitation iPods. But Shanzhai culture has now evolved from imitation to innovation. Here, manufacturers are developing products to suit the needs of those unrepresented in corporate market research. A typical Shanzhai product spotted at the Gangding Computer Markets. These Bluetooth speakers have a Bose logo, control buttons in the shape of an Apple logo, and the form factor of a Beats Pill+. In the west, phone companies decide what features to include and to what specification. There’s a reason why all smartphones kind of look the same and have comparable features. But in the Pearl River Delta, if someone with a limited electricity supply needs a phone with an enormous battery but doesn’t need a camera, that’s exactly what gets made. Disparate parts bins and imitation designs have allowed manufactures to innovate from the ground up. The ultra-modern, state-of-the-art side of Guangzhou fuses with the more traditional side of the city in the form of the electronics markets. Here you’ll find booths of men and women hunched over soldering irons and lathes, repairing and creating smartphones, tablets and another kind of electric device you can imagine. This ecosystem has bypassed the mainstream ideals of mass production and regulated retail to embrace ingenuity, decentralisation and of course haggling. One centrally-located example are the Gangding Computer Markets, but of course the best are over in Shenzhen. As a rule of thumb, the lower floors are dedicated to OEM consumer electronics and the higher up you go, the more prevalent tech workshops become. People make and repair phones and tablets at the Gangding Computer Markets. For those interested in this phenomenon which has come to define Guangzhou and the greater Pearl River Delta, have a look at this documentary by WIRED. It’s long and jumps around quite a bit but it’s worth watching without skipping ahead as the approach it takes is very nuanced and holistic. If you cbf to watch it just what the second video which is like two minutes long. Also check out the third video where a guy builds his own iPhone in Shenzhen, giving first-hand insight into how the tech economy functions there. Aside from the urban villages, other remnants of local culture to persist in this sprawling megalopolis. Green spaces such as the Liwan Lake Park are congregation points for the city’s elderly. Go for a morning stroll and you’ll see grannies singing karaoke and old men dancing, people doing tai chi and playing board games. It’s a beautiful scene of humans coming together, and a much more dignified arrangement than locking up old people in nursing homes like we do back in Australia. Old ladies having a morning linedance at Liwan Park. Old men playing shuttlecock in the morning at Liwan Park. Food is another constant. Guangzhou’s yum cha restaurants are among the world’s best. To understand just how big a phenomenon yum cha is there, consider that many restaurants have tables numbering in the hundreds. Being the ideal breakfast food, I could not think of a better way to begin each day in Guangzhou than to gorge on dim sum. Most traditional are the garden restaurants which have several dining halls set around courtyards, lakes and parks. These are the yum cha restaurants where trolleys roam around with piping-hot dumplings. Another, more modern type of yum cha restaurant is also very popular in Guangzhou. These are in regular buildings and have a la carte ordering. The dim sum are expectedly excellent at both types of restaurant. Dumplings are supple, buns are fluffy, and meat is tender. On top of that, the ingredients are so much better than the yum cha I’m used to. Prawn dumplings use large, whole prawns rather than much. Chicken feet are enormous with much more meat on the bone. Noodles are oh-so-delicate. Honestly these dim sum look pretty typical but they were so much nicer than anything I’d had before. Then of course there’s the service. Of course, having waiters dutifully push around trolleys with fresh means that you can get eating very quickly. But there’s still some reading involved, not to mention the modern restraints with actual menus. Nevertheless, the waitstaff at every yum cha restaurant we went to went above and beyond to serve a bunch of dopey, non-Cantonese-speaking foreigners. I pull out my phone, open a translation app and hold it over the tea menu. Onscreen, the Chinese characters morph into English words punctuated by gibberish. It’s confusing, but enough to get the gist. We point at jasmine. Sometimes, however, the translations can be a bit more unusual. Using Google Translate’s goggles feature, mushroom is universally displayed through my phone’s camera as “fungus”, while chicken often appears as “chanticleer” or “fowl”. In one restaurant, what appeared to be the most popular dish appeared as “intestines”. Of course I had to try them, but it turns out the name was just a euphemism—hóng mǐ cháng are small rolls of minced prawn wrapped in red rice paper which merely resemble intestines. Not only was everyone patient as we pointed at pictures on the menu and tried to ask about portion sizes, but everyone also pulled out their phones to translate their speech into English. It was really heart-warming to see how much they cared about us good meal and understanding what we actually ordered. Combined with me translating menus in real time on my phone’s camera, it was such a cool experience. The future really is now! One of the many dining halls of Panxi Restaurant. We were lucky enough to be allocated a table by the water in what was also the only less-than-packed room! But the ultimate bastion of traditional Cantonese culture in Guangzhou is the Chen Clan Ancestral Hall, a historic centre for culture and commerce. Built in 1894 as for study, ancestor worship and trade by the 72 Chen clans around Guangdong Provence, nowadays the building serves as a folk art museum. Here among the intricate courtyards you can see stunning examples of traditional carvings as well as porcelain, lacquer, lime and stucco work. The Chen Clan Academy (built 1894) is overlooked by highrise apartments (built circa 2010). The collection is not only extensive but truly impressive. Ivory is carved to a level of intricacy beyond comprehension, while period furniture sheds light on times past. The architecture is also exemplary, showcasing the Lingnan style found in southern China and northern Vietnam. On a side note, I also visited Beijing on this trip. I was particularly excited to see the cultural items and architecture of the Forbidden City, which turned out to be non-existent. The architecture was forgettable, and the best cultural items were foreign clocks whose mechanisms weren’t even in operation. The Chen Clan Academy, on the other hand, exceeded my expectations for both of these categories. Although it’s not very big, I found it to be a great place to experience traditional culture and architecture. Intricate stuccowork on the facade of the Chen Clan Academy. No cyberpunk megalopolis would be complete without its own Tower of Babel, rising above the smog to separate the elites from the common man. The Canton Tower does not fail in playing this role, with its rainbow-illuminated, hourglass-shaped exoskeleton being one of the sleekest and most futuristic designs I’ve ever seen. Its design defies any architectural convention, more resembling a kid’s drawing of a tower than any of its foreign counterparts. Upon completion in 2010 it was the tallest tower in the world (now it’s the second-tallest). If ever there was a testament to the human spirit of an unprecedented economic and technological boom… this is it. The Canton Tower just doesn’t look real. The shape is too cartoonish, the colours are too vivid, and it always looks off balance. But it’s very real, and very cool! But the best views are from the bubble tram—an observation ride which revolves around the circumference of the very top of the tower. Hanging over the edge of the structure is exhilarating, and you really can see in every direction. Floating up high in our glass capsule was another scene taken straight from a cyberpunk film. It was such a refreshing change from towers where the observation decks are only two-thirds of the way up. Riding the bubble tram around the rim at the very top of Canton Tower was awe-inspiring, if a bit terrifying. At night, the city becomes awash with futuristic neon hues. LED billboards preach consumerism while skyscrapers give off an aura of exclusivity. If the industrial revolution posited cities as bastions of unlimited potential despite the reality for many that they became cogs in an inequitable machine, then this is its second coming. But this time, things have been democratised. Silicon Valley, Bangalore or Tel Aviv might be start up epicentres, but decision making is still bound by legacy models of investment and acquisition. Thanks to the Pearl River Delta’s preservation of decentralised manufacturing, direction is decided at every step of the chain. Here technology is developed along the lines of ingenuity, necessity and creativity, as opposed to focus groups or planned obsolescence. And from this fervor comes a city whose pulse has come to reflect the collective aspirations of those who inhabit it. The only thing which hasn’t changed in this brave new era is the fate of the bulk of the workers, whose squalid conditions support our collective obsession with consumption. Oh, and the food. One of the observation decks in Canton Tower. 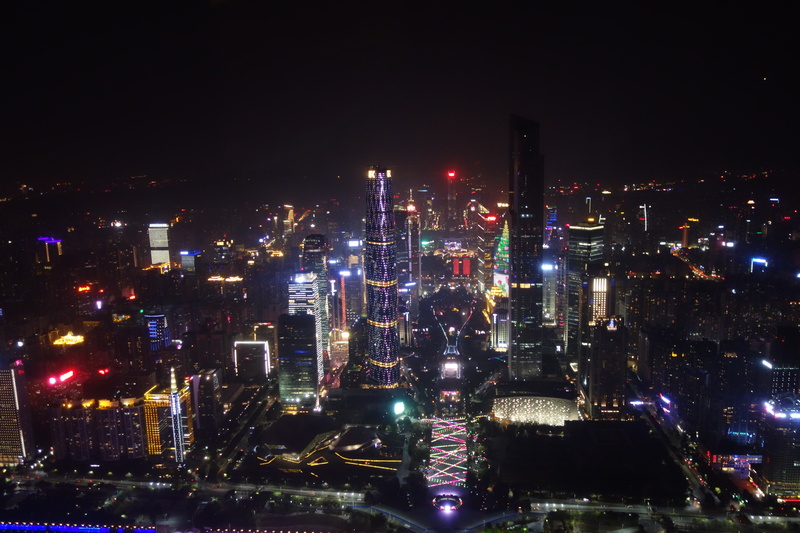 The view from Canton Tower. Highrise development as far as the eye can see, with their illuminated rooftops piercing through the smog in the distance. A market in the alleyways of Guangzhou. Another market nestled between the highrise. The courtyard of Panxi Restaurant is tacky, but in a good way. Panxi Restaurant sits on the lake at Liwan Park. Antique vases at the Chen Clan Ancestral Hall. Many of the urban villages have gateways at their entrances. There’s decent street food to be had in Guangzhou, even if it’s not especially traditional. Around Beijing Road (an upmarket shopping strip) there are all sorts of food stalls. Despite not being a Cantonese specialty, tanghulus can be found everywhere in Guangzhou. They’re caramalised hawthorns, which taste like toffee apples, only more revolting. One of the older, tree-lined streets of Guanghzhou. Qilous are the traditional storefronts of southern China. They emerged in the late 1800s as a combination of Chinese structures with European architectural elements. Around Guangzhou they’re being actively demolished to give way to highrise developments. A barbershop peeks out of an urban village at night. I was in Guangzhou briefly in 2012, but my friend and I decided to stay in Shamian Island where a lot of European colonial buildings were located. We could’ve gone to the city, but as it was the end of our week-long trip in southern China, we decided to take things slowly in Guangzhou. From this post I know that I really should return one day for there seems to be quite a lot of things to see in the city. Btw that documentary on Shenzhen is mind-boggling! Funny you say that Bama as Shamian Island was one place I really wanted to visit but we just didn’t have enough time to squeeze it in I was actually quite surprised with how much there is to see around town, so I’ll definitely be back if I’m ever flying China Southern again. Glad you enjoyed the post though!